All QA engineers know that you cannot throw QA projects over the wall and expect them to come back, magically, done just as hoped. There has to be a level of integration, communication, and management when outsourcing QA to a QA partner even for the simplest tasks. 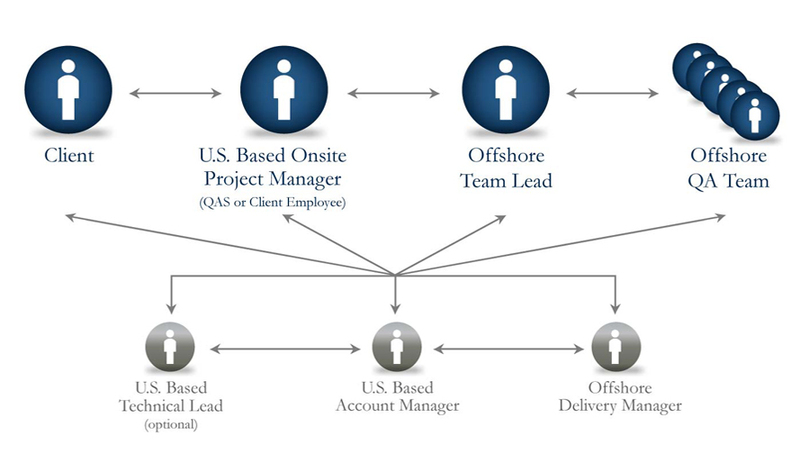 Further, we have found that the most successful outsource model is a hybrid onsite offshore model. 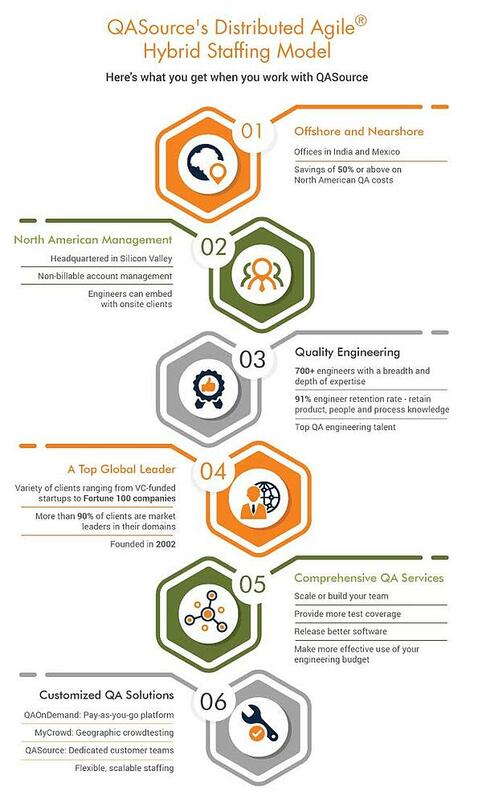 A US-based team lead or project manager interacts closely with the offshore QA lead and a dedicated QA team. Our clients see it as an extension of their current team, with built-in resources that help maintain the quality and communication necessary for the successful completion of QA projects. The US-based team lead can be a service provider or client employee. In either case, this person is the eyes and ears of the offshore team. The team lead works with the offshore QA Lead on goals, deliverables, and timelines, and helps the offshore team understand priorities. The offshore/nearshore QA lead’s primary responsibility is to ensure offshore quality, manage communication, resolve any logistical issues, and attend project meetings. Secondary responsibilities include being a hands-on engineer developing test plans, creating test cases, etc. The offshore/nearshore QA team uses the same existing tools and processes as the onsite team, to become an extension of the onsite team. Depending on the client’s development approach, the offshore team can be added to email aliases, scrum meetings, dev team communications, or anything else that helps the team engage as a part of the client team. The account manager is local, so when something does come up, the customer has someone who is in the U.S., whom they can contact, during local business hours, and say, “We have an issue.” These account managers are measured on their responsiveness and ability to make the client successful. Our Distributed Agile® model provides a solid foundation that can be customized to suit specific teams, deliverables, and approaches. The onsite presence provide sufficient face-time with the development and management teams, and reducing the chances of a disconnect between the US. and offshore QA teams.